One issue that can make sleep so difficult is that of sympathetic nervous system activation. The sympathetic nervous system tells us to fight, flight or freeze. Obviously helpful when you need it, but we rarely do. And being in this sympathetic state makes it harder for us to engage in the parasympathetic side of the nervous system that controls the activities of resting and digesting. This explains why you might have trouble sleeping and relaxing, and why you may just generally feel exhausted. Luckily, there are ways to activate the vagus nerve that help to turn on that parasympathetic activity. There are 2 moves, in particular, that I like to do each night before sleep. They help to give a calming sensation to ease into sleep. They can also be used throughout the day to relax. An excellent resource for further information is the book ‘Yoga Therapy for Fear’ by Beth Spindler. So, for the first move, get into a comfortable seated position with your back straight. Lean your head to the left, bringing your left ear comfortably closer to your left shoulder. Using your right hand, tap behind your right ear with your fingertips and continue tapping in a line from your right ear to your right shoulder. We’re tapping over the path of the vagus nerve, helping to activate it. Just continue to do this, taking your right hand back up to tap from behind your right ear, down the right neck. Each time as you go down, repeat in your head a comforting phrase such as “all is well”. Tapping behind the right ear, down the neck- all is well, and again- all is well. Try to do this 10 times. Just keep your head tilted to the left the whole time. When you are done, it’s best to use both hands to help your head back into an upright position. Next, you will lean your head to the right and repeat the comforting phrase “all is well” as you tap down the left side of your neck, from behind your ear. The second way move to activate the vagus nerve also starts in a seated position. Now, place your hands together in prayer position in front of your heart and lean to the right side until your right elbow touches your right knee. 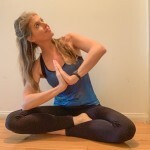 Holding this position, you are going to turn your head to the left slowly as you exhale to where you are looking over your left shoulder, up at the ceiling. You are going to exhale for a count of 6 and then say to yourself “all is well” or another comforting phrase. 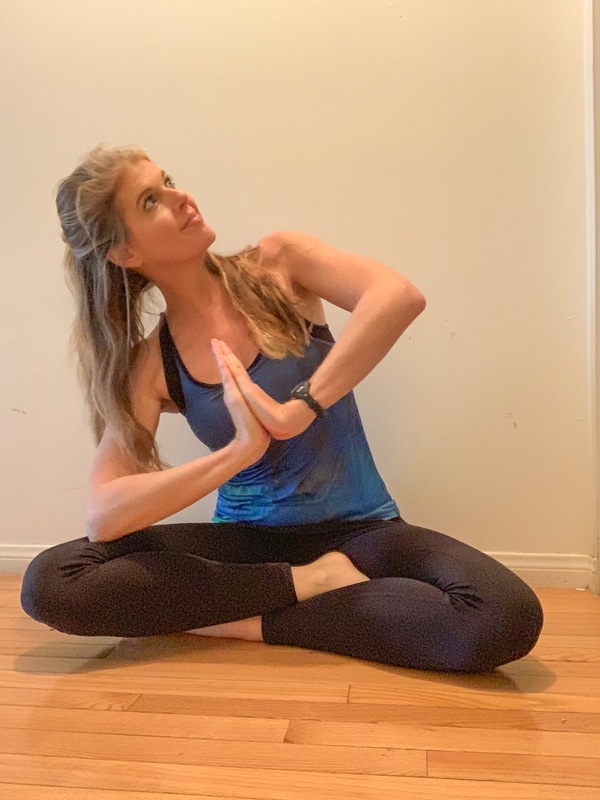 Continuing to hold your body in this position, inhale for a count of 6 as you turn your head to the right slowly until you are looking at your knee and say to yourself at the end “I am good” or “I am loved”, or something similar. Do this 5 times with your right elbow to the right knee and then reverse it with your left elbow on our left knee, repeating the exhaling as you turn your head up to say “All is well” and inhaling as you turn your head down to the knee, ending with “I am good” or “I am loved”. Repeat this 5 times. When you are done, carefully use your hands to bring your head up to the center position and notice the feeling of relaxation. 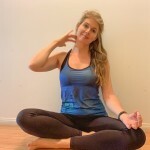 You can repeat these moves as often as you feel the need to, in order to feel that deep relaxation letting you know your body is ready to ease into sleep. It may take a while to get the hang of it but the more you do it, the easier and it is and the better it feels. Let this 12 minute meditation by Dr. Maher carry you away from problems and restore your nervous system. This meditation helps with relaxation is specifically designed for people whose minds tend to wander. It can help to alleviate pain and is great to do with children, as well. Is Sleep Deprivation the Next Tobacco? How 12 simple environmental changes can help you sleep.